Though it’s probably not the best way to start a 1,500 word review by saying this was a record I easily could’ve skipped completely without losing any sleep over its absence, thus implying this is a review that you the reader could ignore yourselves without missing anything of value, the fact that it IS being included in spite of that hopefully should at least make you somewhat curious as to why. Since we just delved into Wild Bill Moore’s start as a rocker in our last review, and since this song is much further removed from the emerging rock instrumental approach, there would seem to be no reason to tackle this when we have such a long (and I mean lonnnnnngggggg!) way to go before we’re up to the present time. Considering Kendrick Lamar just released a brand new single this week (Humble for those reading this in the future) and since we need to plow through approximately 3.8 million more reviews before we get to it (and I have every intention OF getting to it so I won’t spoil the surprise for it’s eventual coverage here by saying how great it is…) then sticking an extra song in the queue would seem to be rather counterproductive, especially when the song being added here is pedestrian at best and misguided at worst. So just what IS Bubbles doing here and are those reasons for its inclusion enough to justify delaying our getting to K-Dot’s latest side by one more day? As we’ve covered already the growing popularity of the sax instrumental was fast becoming rock’s greatest commercial weapon as 1948 dawned. Though no such record had yet made Billboard’s Race Charts (Paul Williams’s Thirty-Five Thirty would break the maiden the second week of February) they HAD been scoring on Cash Box’s regional listings since the fall. Williams was first in that regard as well with his debut Hastings Street Bounce and Earl Bostic’s even more rousing 845 Stomp followed on those listings soon after, setting into motion the sound that would help define the 40’s rock scene. So it was only natural that they take advantage of this growing interest and release even more of these types of records while the public was seeking them out, for who knew how long that would last. With a recording ban looming as 1948 rang in there was also a mad rush to get as many songs laid down as possible before then and it was decidedly easier letting sax players who were skilled at improvising in clubs to essentially do the same in the studio, working up something quickly on the floor as the tapes rolled thereby eliminating much of the need for the time consuming writing process that lyric-oriented songs generally required. But the honking style that seemed to be in vogue thus far was also one that rubbed many of the sax players themselves the wrong way, as it substituted mere gaudy exhibitionism for technical skill. Furthermore because it had the appearance of being rather gimmicky you can bet there was some skepticism amongst record labels about just how long it would remain commercially viable. So just in case it was a short lived fad rather than a long lasting movement it made sense to hedge your bets and offer up something a little more refined, melodic and under control on the flip side and should that approach find an audience as well (or instead) then it’d probably be a relief to everybody involved who could then return to sanity and play “proper” music for respectable audiences like they’d all been brought up to do. Since this effort actually succeeded in that regard and yet still didn’t halt the inevitable move into the musical gutter, it makes Bubbles something more than an easily discarded curio as we look to try and figure out why. The sense you get with this is either they needed something in a hurry and cobbled this together built loosely on the basic framework of the standard “The Sunny Side Of The Street”… or they were consciously attempting to move away from the noisy histrionics that were the order of the day and yet still felt compelled to connect it to that in a way just to ensure it would have something that might appeal to that more ardent constituency. As a result it’s caught between both worlds, the tame and the gritty, and thus doesn’t connect aesthetically in either realm. Not melodically sweet enough to be enjoyed as a strictly a song to sway along to, yet not raunchy enough to result in crude actions best left to your vivid imaginations, and so it sits uneasily in a middle ground, neither fish nor fowl. The structure almost to seems to acknowledge the difficulty of the divergent aims, as the bulk of it tries keeping it close to the vest with Moore playing a repetitive circular riff which is catchy enough to stay in your head, but not compelling enough for you to particularly WANT it to reside there after the record stops. Even when he tries roughening its textures to keep the song rooted in the seamier interests of the after-hours clientele he squeaks more than squeals and so it fails to fully bridge that gap. He also sounds somewhat lethargic at times, almost distracted like he had his eye on something else – a girl… a sandwich… or the clock on the wall telling him he can soon get that sandwich and/or girl! The redeeming feature is ironically Paul Williams, his Savoy label-mate whose earlier forays are likely what helped give Moore a roadmap to follow in terms of what approach to take going forward. Here Williams’ baritone responses at the end of every line are what gives Bubbles its urgency and soul. His decidedly guttural interjections are designed to titillate and arouse and they do that fairly effectively in their limited time in the arrangement. They’re obscene in a way that might draw a smirk and at least will draw your wandering attention back to the record as you anticipate his next appearance. Moore does get a chance to show off a bit on his own during the break and does a decent job with the opportunity, as it’s certainly his best stretch of playing, a little jazzier at first than would generally interest us maybe but a decided step up in terms of quality of playing than the slightly off-key squawks that preceded it. By the end they’re all putting forth a little more effort and now Moore finally allows himself to take off, though again with some flat notes hurting the cause some before pulling it together for a reasonably rousing conclusion. While it’s never offensive in any sense, it’s hardly enthralling and certainly not the direction rock itself was headed in, which is why the aftermath to this release is more interesting than the record itself and thus explains its appearance here on Spontaneous Lunacy. Moore of course had little or no name-recognition amongst the public at this point, certainly nothing to spur them into buying the record just due to his reputation, which was all but non-existant. It was after all only his second single and the first which had been issued the previous summer never made a dent in listeners consciousness, that is if they even came across it at all. Even the participation here of the now red-hot Paul Williams was barely indicated on the label to draw people in out of curiosity. When compared to the more appropriate top-side Swingin’ For Pappy, which while not anything to write home about was at least closer in style to what was starting to make some noise, Bubbles was decidedly behind the curve in every way. So of course you know that means this was the one that somehow connected, hitting #1 in Chicago, #2 in New Orleans and #3 on the New York regional Cash Box charts. Go figure! What makes this notable though isn’t its success, even as hard as it is to fathom considering how pedestrian it all sounds, but rather that in spite of that success it didn’t stop, or even slow down, rock’s embrace of the frenzied new frontiers on the vista. In later years many of the saxophonists who specialized in that garish style of honking and squealing would renounce it and claim they were forced into it against their wishes simply because it sold. But this refutes those claims by showing that there WAS still a viable commercial option in playing it safe at this time and yet virtually all of them, Moore included, headed off the reservation to explore the wilder side of life. 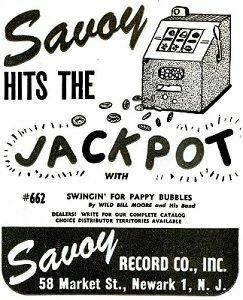 When they were rewarded for that adventurous spirit with even bigger hits it seemed to blur their collective memories of the genuine success of something like Bubbles, a record that as 1948 dawned was still commercially appealing but already creatively spent. In the end I think deep down they knew this all along and they made the right decision to forsake it for something more exciting. Whether I made the right decision to include this review to delve into that overlooked fork-in-the-road moment in rock history is less certain and not for me to judge. Leave a reply on "Wild Bill Moore: “Bubbles”"